USA made American hickory full size 19" tomahawk handles - Straight grain. 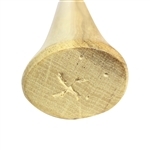 Small American Hickory Handles - 16"
USA made American hickory SMALL size 16" tomahawk handles - Straight grain. Walnut Stained Hickory Tomahawk Handles - 19"
USA made Walnut Stained American hickory full size 19" tomahawk handles - Straight grain. Double Throwing Tomahawk American Hickory Handles - 19"